Nothing but nice things to say, best helmet I've owned. The graphic gets lots of compliments, fit is perfect and comfortable. Motorway riding is a breeze with the NXR. 3D COMFORT LINERS - 3 dimensional interior pad for increased comfort whilst being worn. 4 SHELL SIZES - Different shell sizes throughout the range mean if you order a small helmet, you get a smaller shell; this reduces stress on the neck and combats fatigue. 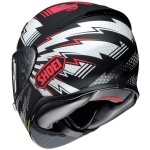 ACCESSORIES - Supplied with a type F breath guard and type D chin curtain and clear CWR-1 Pinlock insert in the box. AIM SHELL - Organic fibre and multi-composite fibres constructed in multiple layers for a shock absorbent shell with optimum rigidity. DOUBLE D RING - Still the safest retention system; easy to handle and allows a perfect fit. EAR PADS - Optional ear pads included to reduce ambient noise even further which is particularly handy for long tours. EPS LINER SYSTEM WITH MULTIPLE DENSITIES - Protection is optimised through multiple density EPS as each density has different shock absorbing levels. EQRS SECURITY SYSTEM - In the event of an accident the Emergency Quick Release System allows removal of interior pads whilst the helmet is still on the head. This will allow the emergency services to remove the helmet whilst keeping the casualties neck and spine straight with as little movement as possible. INTEGRATED SPOILER - Optimises aerodynamic performance and creates a pocket of low pressure to draw air out of the ventilation system. MULTIPLE VENTING AND EXTRACTION - 4 inlets on the brow and chin to guarantee a fresh air supply. 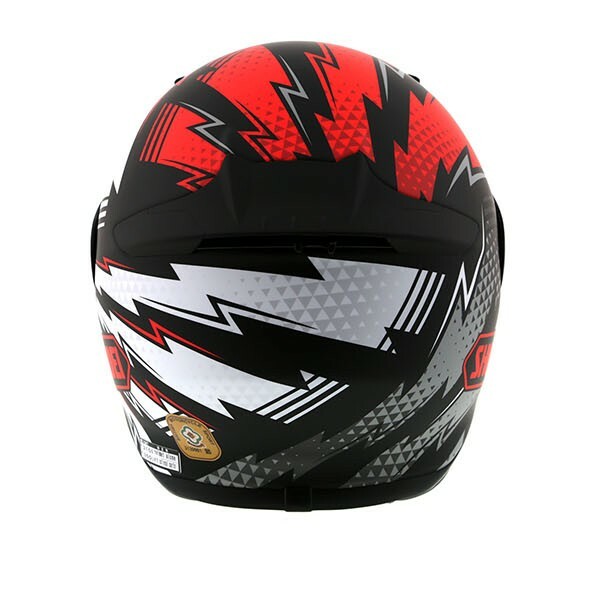 6 outlets at the rear to exhaust warm air from inside the helmet. 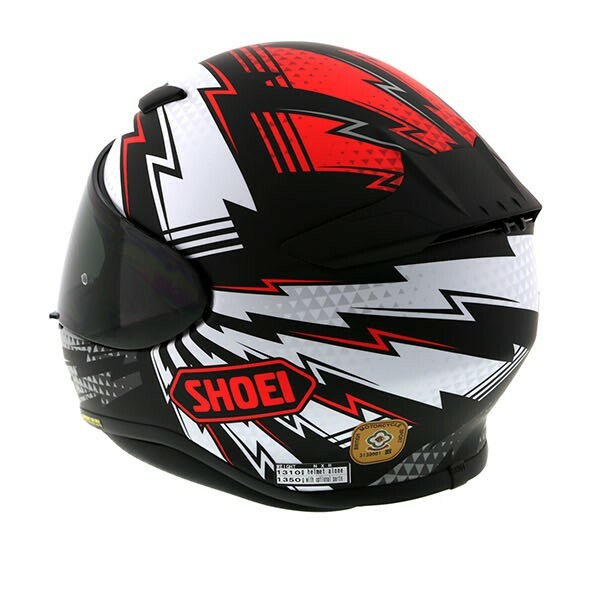 Shoei manufacture all of their products using the keywords quality & value, and have used these criteria ever since they began manufacturing motorcycle helmets in January 1960. 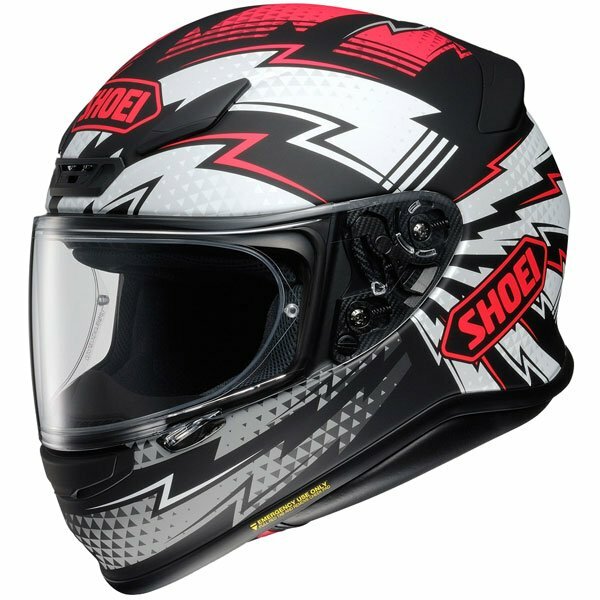 The Shoei helmet brand has always been at the forefront of motorcycle helmet technology since its creation, and continues to lead in terms of technical innovation, design, and safety. 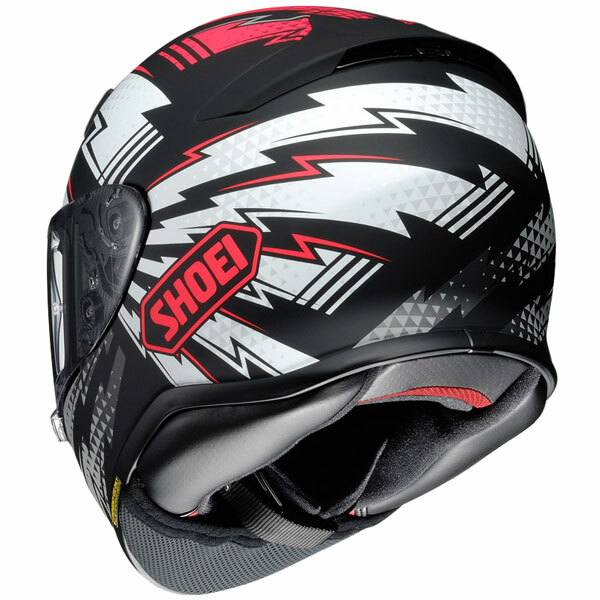 With over 50 years experience, they continue to manufacture the entire Shoei helmet range in Japan to this very day. 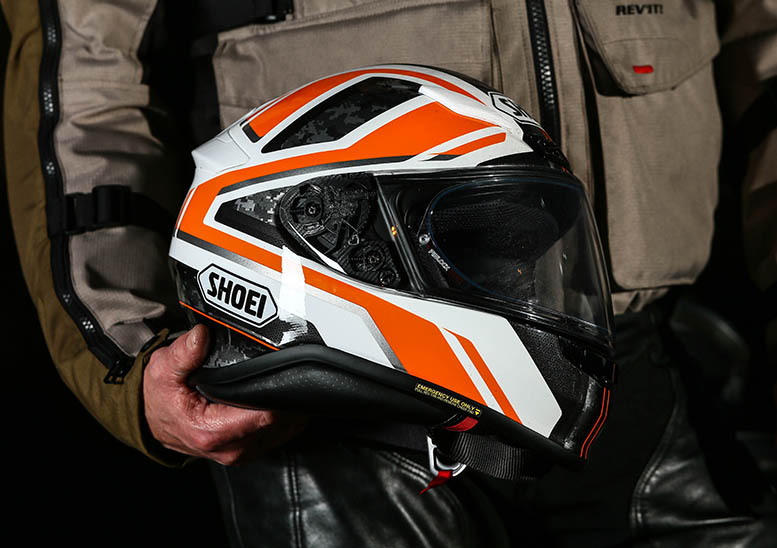 Whilst the brand can undoubtedly be described as premium, Shoei helmets offer fantastic value for money when you consider the serious levels of comfort, build quality and technology that go into every helmet they produce. 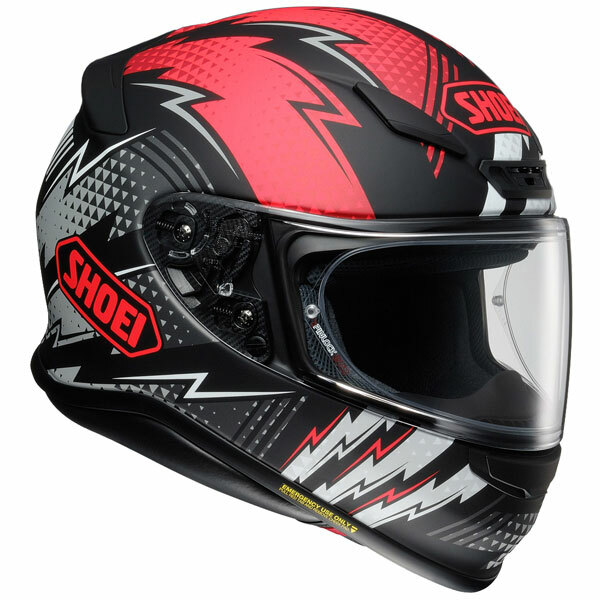 Shoei develop all of their bike helmets with a specific philosophy in mind which they call the Shoei Safety Concept. The thinking behind their philosophy is that crash helmets must be developed to ensure maximum head protection, whilst also providing unrivalled levels of comfort. 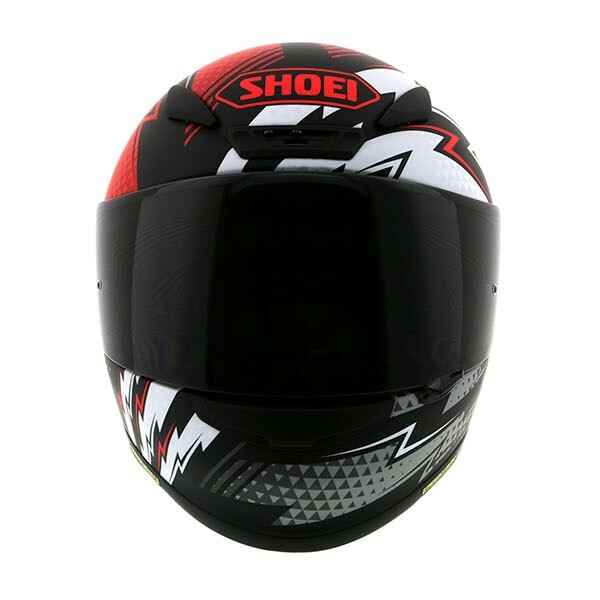 Ultimately, Shoei believe that a relaxed ride provided through comfort makes a highly important contribution to the rider's safety. The safety elements of each bike helmet come under one of two headings, Passive or Active Safety. Passive safety includes focus on such elements as impact absorption and material rigidity whilst active safety refers to emphasis on ventilation, fit and noise reduction. Shoei are now, truly, one of the most popular and most highly rated helmet brands in the world.